Collagen is a protein that is found in the skin. It makes the skin look full and smooth. In addition, it sustains our internal organs, muscles, tendons, cartilage, and is also present in teeth. Collagen makes up 25 percent of the total amount of protein in the body. As you age, collagen production decreases. This results in the appearance of wrinkles, scarring and sagging skin. Expressions Collagen Jelly (Jello) combines patented and top quality ingredients that are uniquely formulated and clinically tested to increase skin collagen and hydration. It contains the highly bioavailable hydrolysed deep sea collagen peptides from France. 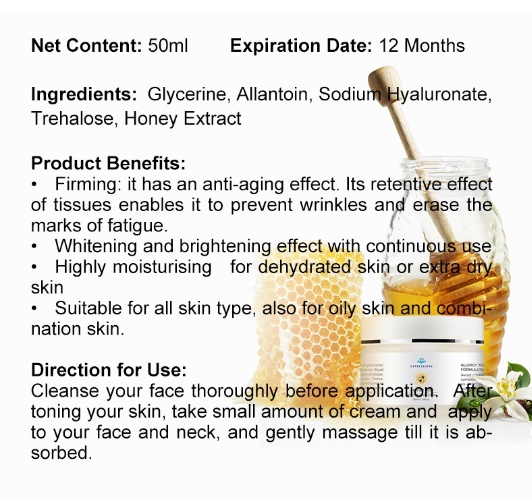 Together with Manuka Honey, Royal Jelly, Formosa Ruby Djulis extract and Vitamin C, this formula allows for skin rejuvenation, softening and repair. Enjoy all the beauty benefits in the form of delicious jelly sticks. 100% Beauty Nutrition! No Preservative! Jello is an award winning product. What makes it outstanding and different from competitors is its formulation from France. Furthermore, it has 5 key potent ingredients that work wonders for beauty from inside out. As we age, collagen production declines — it is happening as you read this! You’ll notice it physically: looser skin, more wrinkles and less elasticity. Increasing your collagen level helps to renew and repair skin cells, and makes the skin look firmer and smoother. Our Jello increase the COL1A2 gene (collagen synthesis gene) expression and decreases the MMP9 gene (collagen degradation gene) expression significantly. After using for 4 weeks, collagen content in skin is boosted for maintaining elasticity and tightness. Collagen peptides, formulated for optimal absorption, increase skin elasticity and hydration. It moisturises and reduces imperfections for an even skin tone. This results in a youthful and flawless complexion. On top of that, it also supports hair, nail and joint health. Additionally, the high concentration of the amino acid Glycine stimulates gastric acid secretion and thereby aids in digestion. Royal Jelly has a whole lot of health benefits. The main benefits include boosting our immune system and aiding in healing wounds. Its ability to prevent cancer growth, lower blood pressure and cholesterol, improve liver function and promote healthy digestion makes it an excellent nutritional supplement. Its capability to increase metabolism helps in weight loss efforts. With anti-aging effects, it protects skin by enhancing collagen production. Beneficial for both genders, it eases menopausal symptoms in women and increase male fertility. Interestingly, it is also a brain food that can improve cognitive function and memory. Manuka Honey is a unique type of honey with natural antibiotic attributes produced in New Zealand. Its uniqueness lies in its nutritional content – four times that of normal flowers’ honey. Known for its immune boosting abilities, it can help to alleviate seasonal allergies and reduce the need for medications. The other benefits include healing sore throats, digestive illnesses, curing Staph infections and gingivitis. Its rich antioxidant, anti-bacterial and anti-inflammatory characteristics can treat conditions like wounds, burns, skin infections, acne and sinus, improve dental health and promote restful sleep. Formosa Ruby Djulis is extracted from a cereal plant in Taiwan and is gaining attention as a health and skincare food based on antioxidant and anti-aging properties in recent years. It is found to increase collagen and moisture content as well as reducing melanin formation. Vitamin C is an antioxidant that plays a role in collagen synthesis and iron absorption. These contributes to overall beauty and wellbeing. Vital to skin health, collagen lowers the likelihood of a wrinkled and dry appearance. It boosts our immune system, treats the common cold, helps in healing wounds and facilitates the growth of body tissues. High concentration of Vitamin C in blood lowers the risk of stroke, cancer, cardiovascular and eye diseases. One of the main components in your skin is collagen, and it is mainly found in the dermis. The dermis is the bottom layer of your skin, and it is responsible for maintain elasticity. When collagen levels begin to decrease, you will begin to notice fine lines and wrinkles forming around your mouth and eyes. 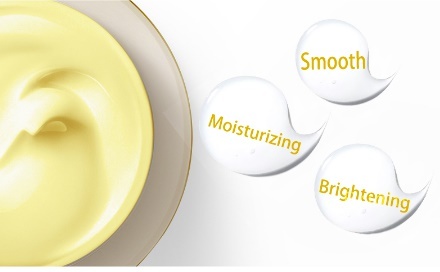 Adding Expressions JELLO can help the dermis keep your skin firm and supple for a beautifully flawless complexion. Dry skin is a common problem that can be easily treated with collagen supplements. Expressions JELLO can help moisturise and diminish the appearance of imperfections. Along with moisturising and hydrating dry skin for a more even skin tone, JELLO can also improve joint and tendon health. Collagen is essential for the health and appearance of your skin for it reduces the typical signs of aging. Collagen is an important building block for elasticity, and its ability to reduce the appearance of fine lines and wrinkles. While the aging process cannot be avoided, you can improve your health and have flawless skin by adding Expressions JELLO to your skincare routine. Vitamin C is one of the most abundant nutrients in nature against skin aging and darkening. Expressions JELLOgives it elasticity and makes it look young and firm. Aside from giving you fairer and brighter skin, Vitamin C in JELLO can fights redness and inflammation. It can remove red blotches on the skin and is effective in treating acne and rosacea. 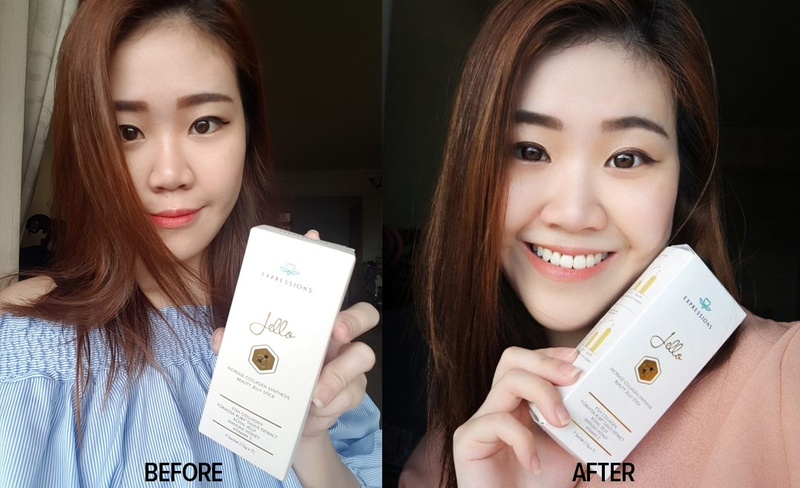 ” My skin look more refresh and younger! There’s no more inflammation nor swelling anymore! ” I super love the concept of having to enjoy the Jello as sweet treat and receiving the benefits for my skin! My skin looks more radiant, firmer and bouncy! Take 1 sachet a day as a dessert or snacks. Please store a cool, dry place. Keep away from direct sunlight. Do not use if seal is broke. If you have any known or suspected medical condition/taking any prescription or OTC medication. Suitable for all skin type, also for oily skin and combination skin. 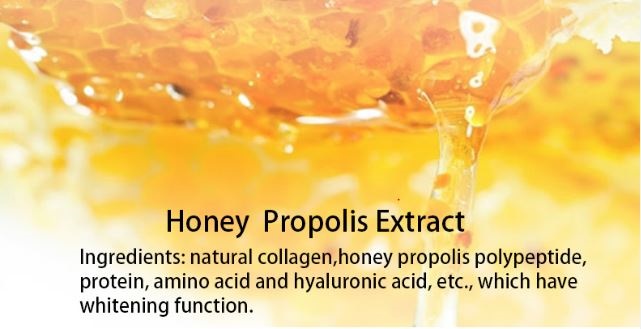 Honey Propolies Extract: includes natural collagen and hyaluronic acid, which have whitening and moisturising effects. Trehalose: prevents cellular dehydration. When applied topically, it allows the skin to retain moisture that it would otherwise lose, creating dry skin and potentially increasing aging signs. Sodium Hyaluronate: Regarded as “moisturising gold” by the beauty industry, the moisturising property can retain 1,000 times of moisture. It effectively controls the balance of water and oil, and prevents the oil from overreaching.